Islamabad, November 15, 2018: Pakistan’s premier health services institution, The Indus Health Network (IHN) has collaborated with the Ministry of National Health Services Regulation and Coordination (MONHSRC) and hosted the Stakeholder Engagement Conference for National Vision for Surgical Care (NVSC) 2025 today at Serena Hotel, Islamabad. 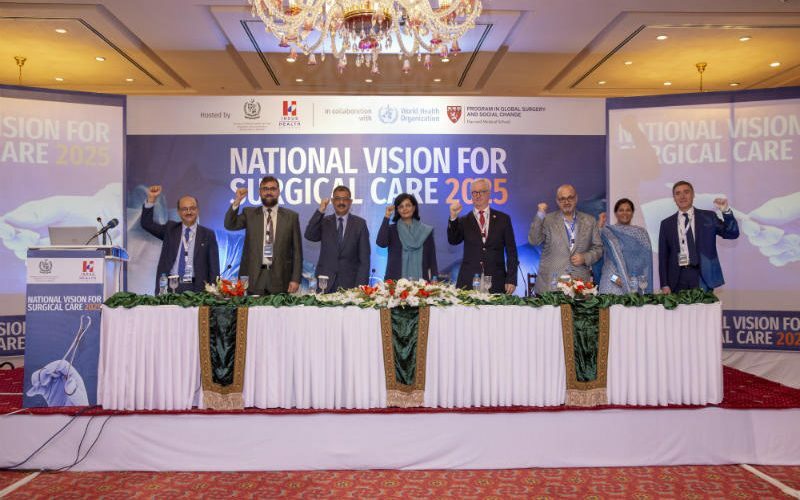 Additional Secretary for National Health Services, Regulations and Coordination, Iqbal Durrani inaugurated the NVSC 2025 Conference advocating the need for strengthening surgical systems in Pakistan and creating a roadmap which includes development of infrastructure, technical expertise and service delivery. The conference was attended by the federal ministries, provincial government departments, local and international surgeons, anesthetists and obstetricians. NVSC 2025 Conference was led by the Indus Health Network in collaboration with the Ministry of National Health Services Regulation and Coordination (MONHSRC), with technical support from the World Health Organization and Harvard Medical School – Program in Global Surgery and Social Change. A steering committee of 25 local and international experts guided the process. The steering committee was chaired by Dr. Safi Malik, Director Programs-MONHSRC and Dr. Sania Nishtar, President Heartfile. Globally 5 billion people lack access to safe and lifesaving surgical care. Majority of these individuals live in Lower Middle Income Countries including Pakistan. Moreover, 16.9 million people die from surgically preventable diseases each year and approximately 28-32% of the global disease burden is attributed to surgically treatable conditions. This includes childbirth complications, cancer related surgeries, surgeries that can improve vision – such as cataracts, heart disease related surgeries and much more. Additionally, unsafe surgical care can cause substantial harm and can create further complexities. Through the NVSC 2025 Conference, Pakistan is working towards improving health strategy to ensure that adequate, lifesaving surgical care is universally available.